Ok, so I missed June. And July. Here we are in August. There is so very much depressing stuff going on out there. Sometimes we need an antidote to all that, to remind us that there is hope, that there are amazing people doing amazing things, and that we too can be amazing – and maybe we already are ;-). I’ve been to two really interesting (free) talks in London in July and August. They were in (under?) this year’s very beautiful Serpentine Pavilion in Hyde Park. 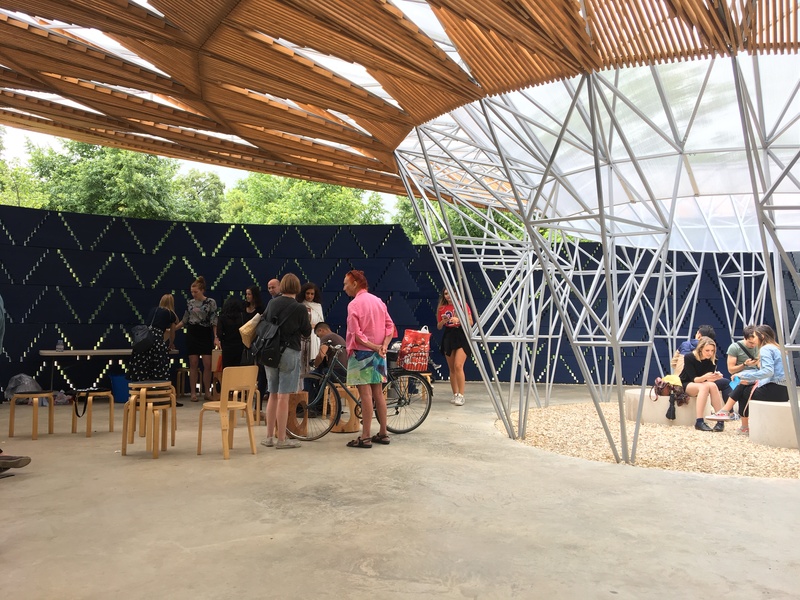 Designed by Francis Kéré, it’s the first Serpentine Pavilion designed by an African architect (he’s from Burkina Faso), and he was inspired by his memories of ‘gathering, debate and community around a tree in his village’. The talks were part of a series called Radical Kitchen: Recipes for Building Community and Creating Change. They were preceded by a buffet picnic mainly for the presenters prepared by Masi Mas, a group of refugee women who come together to cook. Delicious food, beautifully presented, all with interesting back stories. The first one I went to was a presentation by people from the Brixton People’s Fridge (SUCH a great idea!). The next one was by You Make It – a programme of workshops, mentoring and courses to empower and inspire young unemployed women in East London – the two inspiring things about this were hearing the CEO explain why and how she set it up; and hearing from three young women currently on the programme talking about the difference it has made in their lives. There are more to come – one each Wednesday in August. I hope to get along to at least one more. Do go if you have the chance, I promise you’ll come away feeling uplifted. Or just go and visit the Pavilion. Especially if it’s raining hard. And they have planted a seed in my mind to think about how I can use the ideas myself to…..
It’s clear that waiting for ‘them’ to make the world or our town a better place is simply not going to work. So I was heartened last month to see a really positive and thought-provoking film reflecting the ideas of the Transition Movement. Called Demain (Tomorrow), it follows a group of young-ish French people in their exploration of what they personally can do to change the future facing them and their children. It’s a really positive film, and if you haven’t yet seen it and particularly if you aren’t familiar with the Transition Movement, I would really recommend seeing it. Afterwards you can look around your own community and marvel at what’s already being done, and ponder what you can do (or maybe you’re already doing) to make the positive demain a reality and not just a dream. Which is what I’m doing right now. At Bath City Farm we have long had an ambition to build a real cafe, which can be open all year round and provide space indoors for people to sit and eat, drink, and chat. At the moment we have a very sweet little kiosk, with a small covered pavilion for shelter but nowhere in the warm and dry for those occasional cold, wet, windy days (like, in July and August for example). We’ve edging closer towards being able to achieve this, because we’ve recently been given a grant from a local charity to pay for all the professional help we need to ensure that such a project is viable, before we go ahead and launch a major fundraising campaign. It’s very exciting to be involved in, and also very daunting, but we have masses of support in the local community and beyond. If we get the go-ahead, we’ll need to raise A. Huge. Amount. Of. Money. But I’m a great believer in the power of positive thinking. One of the things that spurs me on with our cafe project is that, several years ago now, I was out walking locally and met two cycling friends who asked me to sign their petition asking for the long-closed nearby railway tunnels to be opened up for cyclists and walkers. I laughed, and said I would sign but it would never happen. How wrong I was! With much hard work by them and a small band of supporters, a crazy idea they dreamed up one night in the pub became the reality that is now the Two Tunnels Greenway. I use it most days, and so do many, many other people. Which just goes to show. Yesterday I came across a small pocket garden on Walcot Street in Bath. 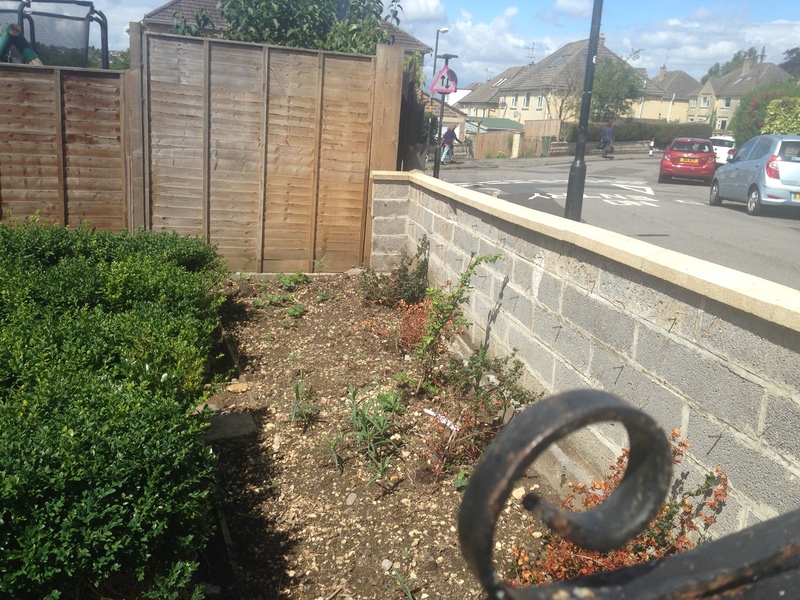 Created recently by a group of local people on what for many years has been a weed-covered eyesore. If they can do this there, we can do it anywhere. Or everywhere. 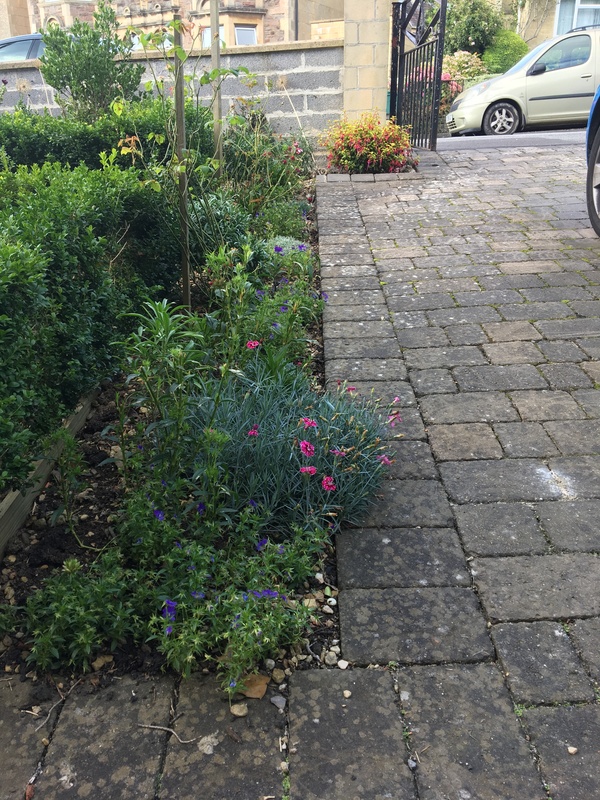 On which note, I thought I would share with you the progress we have made in our hitherto lacklustre, unloved front garden. Which you may recall looked like this. I removed the hebes, which had long outgrown their space. Malcolm cut the box hedges down to a more appropriate height (more trimming to come). I have planted some fruiting shrubs along the front wall bed. In time they will cover and hide the breeze block wall. I have cleared all the beds of weeds and started to improve the soil (and boy does it need it). 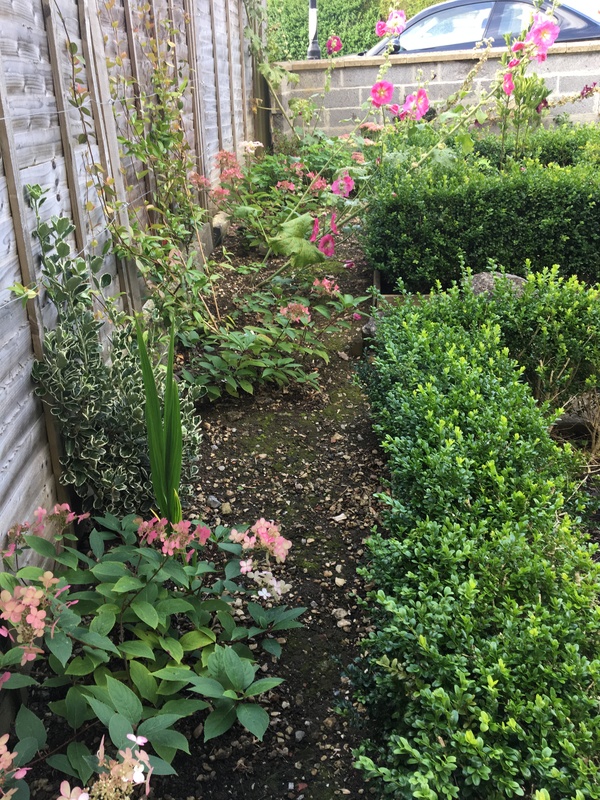 I have planted hydrangeas and climbers along the fence bed; roses, pinks, pansies, wallflowers, sweet williams, and some bulbs in the bed alongside the paving. But my proudest achievement is the hollyhocks I grew from seeds collected from the roadside last year. I started them off in the late summer, planted them out in the autumn, and am enjoying their blooms right now. Previous attempts with hollyhocks have all failed as the slugs have eaten them all. Now I think the front garden is less prone to this, and putting in larger plants to begin with helped too. So next I will do some more hollyhocks (of which you can never have too many) and some lupins as well. There’s plenty more to do here, but I feel I’ve made a good start. Watch this space as it develops – my plan is to plant a dwarf apple tree inside each of the four box squares. Now I've passed 60 I'm still doing all sorts of things I haven't done before, as well as carrying on with the things I already love. I live a happy life with my long term love Malcolm. In my blog I explore local and low tech ideas, food, growing, making, reading, thinking, walking, and lots of other words ending in 'ing'. This entry was posted in Climate change, Community, Inspirations, Reflections on life (and death), Seeing differently, Travels, Uncategorized, Whatever next? and tagged Bath City Farm, Community, Demain film, Food, Living, Radical Kitchen, Reflections, Serpentine Pavilion, Transition movement. Bookmark the permalink. The garden is inspiring. I plan on hollyhocks and lupines next year (collecting seeds now)! Oh, thanks for that Dar. And yes, hollyhocks and lupins are so gorgeous. Hope your seed collecting / sowing goes well.